I was always a softy for good old war films, especially sea and air battles. 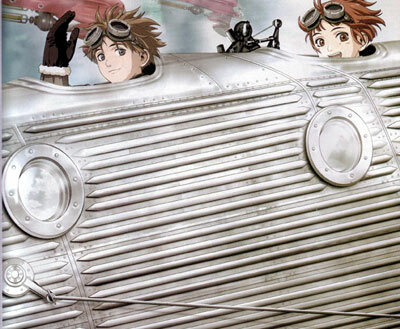 So when I watched Lastexile a smile crept across my face while watching the epic sky battles. The rich visuals accompanied by the awesome sound as vanships (the flying bathtubs), zipped across in all directions trying to shoot down and shake the enemy. 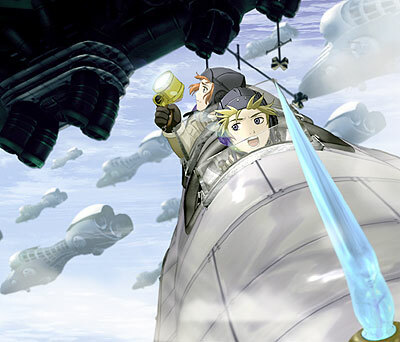 To the sound of ships firing their main cannons and ships going down or exploding. The world is an alternate of the past. The van ships are like a cross between world war two planes and flying versions of antique cars like the rolls royce silver ghost. In fact the main character's vanship even has a figurine similar in appearance to the one found on classic Rolls Royce cars - the lady/Angel with swept back wings. My favourite scene from the series and one of my favourite of all time is the scene with Al (short for Alvis), when she first sees the toy goat. There's no talking in this scene, just the movements of the character and the perfect accompanying music.